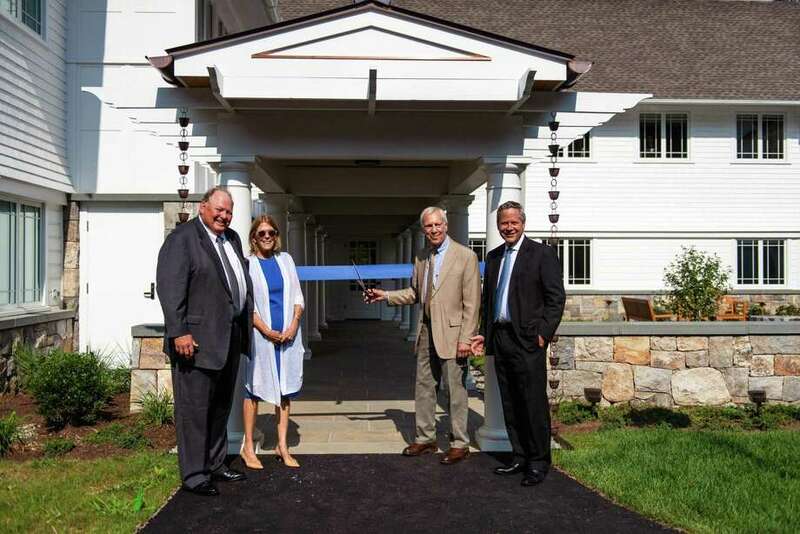 Honorees Sigurd Ackerman and Elizabeth Moore pose with Silver Hill Hospital board members at the Sept. 6 official ribbon cutting ceremony to dedicate the new Sigurd Ackerman, MD Center for Evaluation and Admissions building at Silver Hill Hospital in New Canaan. From left, Peter Orthwein, co-chair of Silver Hill Hospital’s Board of Directors; Moore, former chief operating officer; Ackerman, former president and medical director; and Lance Lundberg, co-chair of the hospital's Board of Directors. Silver Hill Hospital, one of the nation’s pre-eminent psychiatric hospitals, recently opened a new 8,000-square-foot admissions building on its 44-acre campus. The new building, the Sigurd Ackerman, MD Center for Evaluation and Admissions, is named for Sigurd Ackerman, immediate past president and medical director of the hospital. Ackerman served in this capacity for 14 years and was honored at a dedication ceremony for the new facility. The new evaluation and admissions building was constructed to accommodate the growing admissions and evaluation processes at the hospital. The design ensures patient privacy, and the building also houses business offices and a resource center for both family and alumni. At the building dedication, the courtyard area was also dedicated to the hospital’s former chief operating officer, Elizabeth Moore. The building took 16 months to complete, with new construction starting in May 2017; contributors included Richard Turlington Architects of New Haven and the PAC Group of Torrington. Impact Fairfield County hosted its first of two Fall Kick-Off events on Oct. 3 at Grace Farms in New Canaan. Over 50 members and guests were in attendance to hear from its two 2018 $100,000 Impact Grant winners and learn more about membership and participation in Impact’s 2019 grant cycle. Impact Fairfield County Co-President Wendy Block welcomed everyone and spoke briefly about how membership in Impact works and the strides made in the three years since Impact’s inception. She applauded the $560,000 in grant funding that Impact has been able to provide to exceptional organizations from throughout Fairfield County. Steviann Martines, vice president of Impact Fairfield County, then introduced the 2018 Impact grant winner representatives. Matthew Quinones, CEO of the Stamford Public Education Foundation, talked about how its Ready. Set. Shine! program, awarded one of two $100,000 grants this year, has transformed the lives of 77 Stamford children in need through its six-week early-education program this summer. For information about Impact Fairfield County, visit eimpactffc.org. The 11th annual Autumn Classic Tennis Tournament benefitting Norwalk Grassroots Tennis & Education, a 23-year-old youth development nonprofit, was held on Sept. 30. The lead sponsors were Laurel Road Bank and the Lublinsky family. NGTE touches the lives of over 500 student-athletes, offering free year-round tennis instruction, education support and life skills programming to Norwalk youth living in public or subsidized housing. The Autumn Classic was open to all public and private varsity and junior varsity high school students in the area, and was played at the Weston Field Club and Longshore Park in Westport. Over 150 young men and women representing their schools fought hard in competitive but fun doubles play. Tournament coordinator and NGTE board member, Mark Magnusen, thanked the sponsors and players for contributing over $28,000 to help continue the NGTE programs that graduate all participants from high school and help many graduates go to college. “We really appreciate the commitment and support from these high school tennis players and their parents, and our wonderful sponsors. Many of the students who served as Chairpersons and Committee Members for the Autumn Classic also volunteer at NGTE during the year as youth tennis coaches and academic tutors, and they allow us to help our underserved youth realize their potential in Norwalk,” he said. Charlie Low of Fairfield Ludlowe High School, Caroline Mayock of New Canaan High School, Aaron Miller of Weston High School, Will Roddy of Rye Country Day School, Daniel Stone of Staples High School, and Annabel Thrasher of Greenwich Academy all co-chaired the event. Girls varsity winners: Grace Coale and Katie Wiley, Sacred Heart Greenwich and Darien High School; finalists: Gariella Gatto and Allison Katz, St Joseph High School and Staples High School. Girls junior varsity winners: Ellie Collier and Layla Magnusen, Hopkins School and New Canaan Country School; finalists: Iasiah Sena and Erickah Tertulien, Norwalk High School. Boys varsity winners: Andrew Ilie and George James, Trumbull High School; finalists: Conrad Emerson and Henry Murphy, Wilton High School. Boys junior varisty winners: Eric Degter and Thomas King, King School; finalists: Byron Hart and Josh Handel, Weston High School. William Crane-Morris, of New Canaan, is enrolled as a first-year student at Hamilton College. The following New Canaan residents enrolled as part of Colgate University’s Class of 2022: Elizabeth Casey, Phoebe Casey, Charlotte Craig, Haley Fuller, Elizabeth Laub, Emma Schaeffer, Morgan Walling and Nicole Weiss.